Self-adhesive PVC-free poly holders stick wherever they are needed. Sticky-backed holders keep your materials at hand. Self-adhesive PVC-free poly holders stick wherever they are needed. Clear, heavyweight holders with non-rip seams attach to any dry, clean, flat surface. Ideal for convenient storage of instructions or service records on office equipment. Unlimited uses for these adaptable products. 9 x 12. 50/BX. Learn about the wide variety of shop ticket holders at C-Line..
Hi, I'm John with C-Line and today we're going to talk about our Self-Adhesive Shop Ticket Holders. These sturdy holders with a peel and stick back attach instructions, signs, documents and more to any clean, flat surface. They can be used vertically or horizontally to post information wherever you need it throughout your business, warehouse or school. The holders are made from super heavyweight polypropylene with welded non-rip seams to hold up in even the roughest of environments. They have a convenient drop-down front so you can easily insert your information. Then simply peel the liner off the back and apply where needed. 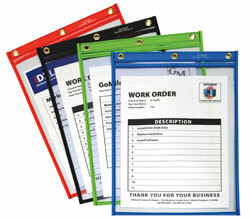 Self-adhesive holders make great sign holders to post flyers and information around the office or the classroom. You can label the contents of storage boxes, bankers boxes, inventory boxes and more. Or, apply them to the back of a door to display evacuation routes and maintenance records. There are unlimited uses for this versatile product. Display information wherever you need it with C-Line's Self-Adhesive Shop Ticket Holders. Order yours now! That's all we have for today. I'm John with C-Line. Thanks for watching.